Rady Children’s cancer team rallies when one of their own children falls ill.
Like most little girls, 4-year-old Kaylee knows her way around princesses, bows and stuffed animals. And, unlike most little girls, she’s an expert in leukemia. With the help of a plush bone toy filled with stuffed cells, Kaylee has learned about platelets, white and red blood cells, and how the treatment she’s undergoing aims to boost her immune system. She now understands that the “yucky cells”—the yellow toys that represent leukemia—are the target of her therapy. Fortunately, her prognosis is excellent. Maybe her experience will inspire her to become an oncologist or a cancer researcher someday. Or perhaps she’ll be inspired by the nurses at Rady Children’s Hospital-San Diego who treat her, a team that includes her own mother. Kaylee’s mom, Kelly Mikulsky, is a nurse at the inpatient oncology unit. She and her family now find themselves on the receiving end of her team’s warm and friendly care, an unusual blending of work and home life that has provided comfort in these challenging times. Growing up in San Marcos, Mikulsky lost her childhood best friend, Jessica, to cancer. “When I was 12, she was diagnosed with a rare type of solid tumor,” she recalls. “For 26 months, she had chemotherapy and radiation. But her tumor ended up coming back, and she passed away when we were in seventh grade.” The loss was devastating, but it laid the foundation for her future calling. The 19 attending physicians at the Peckham Center for Cancer and Blood Disorders treat more than 250 new pediatric patients every year with a variety of childhood cancers. Leukemias, lymphomas, soft tissue sarcomas; brain, bone, kidney, adrenal and liver tumors; they’ve seen it all. Thanks to medical advances, the majority of childhood cancer patients treated here have an excellent prognosis. “We now cure 80 percent of all pediatric cancer patients,” says Deborah Schiff, MD, hematologist/oncologist at the Peckham Center and clinical professor of pediatrics at UC San Diego School of Medicine. The center, which takes up the entire second floor of the new Acute Care Pavilion, is a national leader in pediatric oncology care and clinical research, offering 38 private rooms and advanced air filtration to protect patients with sensitive immune systems. An adjoining play area, Carley’s Magical Garden, is specially constructed to reduce the threat of illness from germs and mold. The Hematology/Oncology inpatient clinic is just one of many Hospital units where the Child Life team is active, and it hopes to expand its services even further with the help of charitable donors. If they’re diagnosed with leukemia, the children learn about the cells that are making them sick and the treatments that aim to vanquish them. Before the 1970s, leukemia was always fatal. “Pediatric cancer treatment today is risk-adapted, meaning that we treat higher-risk cancer more aggressively than low-risk disease,” says Dr. Schiff. “This improves overall outcomes and decreases unnecessary side effects.” Today, patients like Kaylee have more than a 90 percent chance of being cured. “Pediatric cancer treatment today also includes targeted therapy, which specifically targets cancer cells while sparing healthy cells,” says Dr. Schiff. 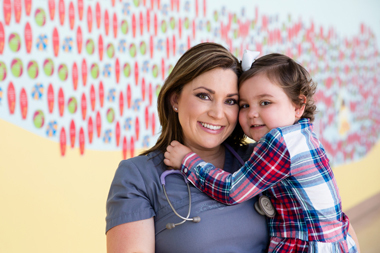 Rady Children’s is currently developing a program to treat relapsed and refractory acute lymphoblastic leukemia patients with an exciting new immunotherapy.